The mightiest fortress of central Europe, a powerful castle sitting in a prominent position, undoubted Salzburg′s prime attraction and most dominant feature of the city′s skyline: the "Festung Hohensalzburg" or "Hohensalzburg Fortress" ought not to be missed at any Salzburg visit. The first record of a fortification on the southern side of the Mönchsberg Mountain dates back to Roman time, but this is not certain. However, it would make sense: from the position of Hohensalzburg Castle one can see the surroundings of Salzburg and the Salzach River better than anywhere else in the entire city. Prince Archbishop Eberhard (1060 to 1088) built the first castle on the Festungsberg in 1077. Initially, this was little more than a bailey with a wooden wall, serving mostly for the protection of Imperial troops of the Holy Roman Empire. However, during the "Investiturstreit", a struggle for power between Pope Gregor VII. and Emperor Henry IV., Prince Archbishop Eberhard decided to stand by the Pope. Under the reign of Prince Archbishop Konrad I. (1106 to 1147), a tower from stone was built and over the course of the following years all through the 12th and 13th century, the fortified area of the castle was gradually increased until mighty walls embraced most of the upper level of the Festungsberg area, called "Bering". The dispute between Emperor and Pope had long settled by then, but new conflicts between Bavaria and Habsburg Austria (then excluding Salzburg) led to new threats for Salzburg and Hohensalzburg Fortress demanded more and more improvements. Prince Archbishop Burkhard III. von Weißpriach (1461 to 1466) built the four main towers along the outer wall: the "Glockenturm" or bell tower in the Northern wall; the "Trompeterturm" (trumpeter tower) in the Northeast, the "Krautturm" (kraut tower) in the North, and the "Schmiedturm" or "Arrestantenturm" in the South. Under the reign of Burhard′s successor Prince Archbishop Bernhard von Rohr (1466 to 1481), the Rohr bastion was built, as he was a ruler in trouble: miners in the South of Salzburg were increasingly dissatisfied with their situation and the rich patricians of Salzburg urged for more power; to make things worse, Salzburg had to fear an invasion of Turkish troops from the East. A better castle was needed. It wasn′t until the reign of Prince Archbishop Leonhard von Keutschach (1495 to 1519) that the only purpose of the fortress or castle changed from a purely militaristic and strategic one into a representative one: the Prince Archbishop′s mines in the South of Salzburg created a massive revenue, representing 10 percent of the global gold production in those days, along with lots of silver and - of course - the "white gold" of Salzburg, the salt of Hallein. The make the fortress a pleasant castle, Leonhard von Keutschach invested vast amounts of money into decorations, modernisation and extensions. His coat of arms, which includes a very characteristic turnip, can be found on marble plates wherever Hohensalzburg Castle was re-modelled under his guidance: in total, you can find 58 turnips in the fortress. Leonard von Keutschach is also responsible for the elaborate "Fürstenzimmer", representative lounges, the St. Georg′s Church and the mechanical organ instrument the "Salzburger Stier". Von Keutschach shaped the castle into a fortress, and until today it was not changed in any fundamental way. He was also said to be a man of bad temper: the mechanical organ "Salzburger Stier" should warn the citizens of Salzburg to obey him and recall the Prince Archbishops power by playing three times a day. Once, so the legend goes a patrician of Salzburg named Georg von Wisbeck, blamed Leonhard von Keutschach of taking a property that belonged to him. The argument in Hohensalzburg Castle between the two of them grew rather emotional and eventually the very tall and strong Prince Archbishop grabbed von Wisbeck by his neck and held him out of the window - from the "Hoher Stock" in one of the towers. Eventually, von Wisbeck admitted that he had been wrong blaming the Prince Archbishop of theft. The only time that Hohensalzburg Castle was under siege was in 1525, when rioting protestant miners, peasants and farmers formed a coalition with some patricians of Salzburg and forced the Prince Archbishop Cardinal Matthäus Lang to flee into his fortress. The troops tried to penetrate Hohensalzburg from the "Wellenburg", and attacked it with self-built armour and wooden cannons. In the "Goldene Stube", the golden room, one can still see a marble pillar with a crack that a bullet caused during the riots. Hohensalzburg Castle on the other hand had major guns and cannons, each bearing names: "Der grob Püffl" fired stone balls of more than 200 kilograms, the "Singerin" was a slightly smaller gun as well as the "Trachl" ("little dragon") and smaller guns called "Skorpion". Needless to say, the rioters failed in their plans and eventually found an agreement with the Prince Archbishop. During the Thirty Years War, Prince Archbishop Paris Lodron (1619 to 1635) had to modernise Hohensalzburg Castle - some roofs were altered and the outer walls were supplemented with an additional layer to make them stronger. At the same time, the city walls along the Kapuzinerberg and the Kuenburgbastei bastion were built and finished in 1681. After the Napoleonic wars, when Salzburg was secularised and became part of Austria in 1816, Hohensalzburg Castle served as a prison and an army camp. A lift was built in 1891, to accommodate the uprising tourism in Salzburg. During World War I, Hohensalzburg Castle was used to imprison Italian officers as prisoners of war. After 1933, Salzburg became one of the areas in Austria that were most fiercely targeted by Nazi underground terrorists, many of them exiled Austrians themselves, fighting for a union with Nazi Germany. When some Nazis launched an attack in Lamprechtshausen near Salzburg, they were imprisoned in the fortress in 1934. This was the last time that Hohensalzburg Castle held prisoners. 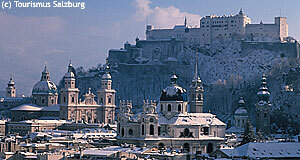 In more recent years, Hohensalzburg was renovated extensively and so looks into a shiny future.